Trust me when I say the International Astronomical Union (IAU) https://www.space.com/29696-international-astronomical-union.html rarely engages the public in astronomical matters. Truth is IAU arrogance rubs many a scientist the wrong way. IAU members have sole authority and discretion in naming astronomical objects and features, but for a stroke of IAU pen Pluto would still call itself planet. Cosmic nomenclature isn’t official until the IAU says so. 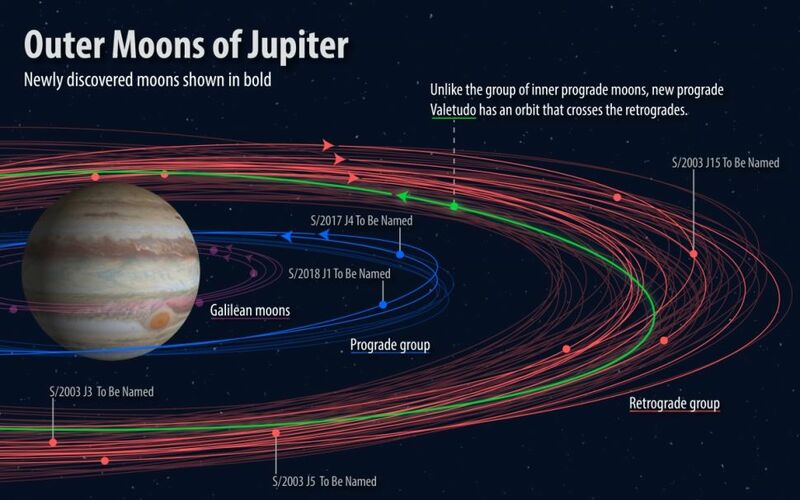 In summer 2018 science discovered twelve unknown moons of Jupiter, now the IAU wants help in naming five. Anyone can submit entries, but guidelines are strict. In keeping with Jovian propriety moons of Jupiter are named for characters in Greek or Roman mythology either descended from or lovers of Zeus. Ponder this before referencing ancient mythology – not all moons orbit Jupiter in the same direction. Those orbiting in the same direction (in this case 2 out of 5) require names ending in “a”, opposite rotation require names ending in “e”. Submissions can’t be similar to other cosmic bodies/features or be culturally offensive. Anyone up for the challenge has until April 15, 2019 to submit nominations and explain why in a single tweet to @JupiterLunacy tagged #NameJupitersMoons. Its been a while since space weather graced this blog, far too long if you ask me. With that in mind, ponder a Sunday night space weather update. As I write solar wind blows at 354.8 km/second, 1,967 potentially hazardous asteroids are identified within 100 LD (lunar distance) from our planet and 2 observable fireballs have been recorded in the past 24 hours. 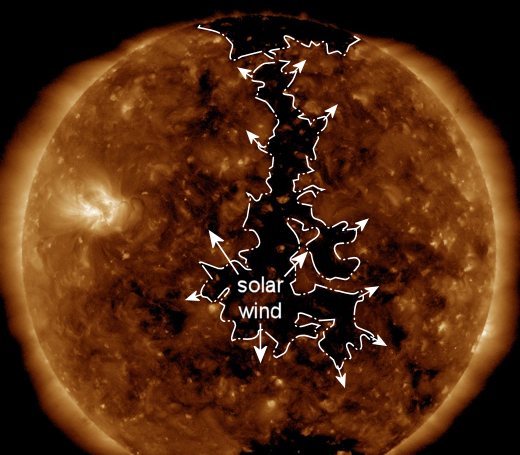 Despite a lull in solar activity courtesy cyclical expectations of solar minimum, a behemoth Earth facing hole in the Sun’s surface catapults solar wind in our direction. Contact with Earth’s magnetic field is anticipated on February 19 or 20th. Aurora watchers can expect geomagnetic storms. In sharp contrast to February 2018 which came and went without a full moon, February 19, 2018 delivers a supermoon designated the closest full moon of the year. Few people know what space weather is, let alone grasp how it impacts life on Earth. If you were a passenger on NetJets flight 795 from White Plains to Burbank last week, you received a radiation dose of x 68.4 that of radiation exposure at sea level. Space weather is real and it matters. Happy Sunday. Adrien Mauduit, my favorite timelapse photographer, posted Winter Wonderland a few days ago. Shot over three months in Senja, Norway, no one better than Adrien to preface a Winter Wonderland…. “Within the arctic circle the winters can be harsh with long-lasting violent blizzards. However when the snow storm lets up and passes, it leaves a completely transformed landscape. All the familiar roads, trees, mountains and lakes are buried under a layer of deep snow taking on different sort of weird shapes. The flimsy birch trees are bending under the weight and look like they are welcoming your into a fairy-tale. The moon and the windless atmosphere play such an important role in creating a winter wonderland. Most of the sequences of this short timelapse film were shot during an interval of 3 days where the snow stuck to the branches. Senja’s ever-changing weather had the best of this fleeting environment very quickly but it took over 3 months to shoot all the scenes of this movie. I really wanted the viewer to feel like they actually were in a dream straight from their winter childhood memory. Much like Narnia or Frozen you can just walk through the enchanted frozen forest, lie down in the scintillating fresh powder looking up at the branches contrasting with the blue sky and the northern lights, and all surrounded by the mountains and the sea. From the pink sunrises and sunsets of the winter polar days to the ice figures created on the frozen shore by the converging tides, not to mention the incredibly colorful displays of aurora borealis, get ready to experience an uplifting voyage through the magical astroscapes of Northern Norway. 15 running shoes containing detached human feet washed up on British Columbia shores since 2007. News of the 15th broke on February 11, 2019 when West Vancouver police and the British Columbia Coroner Service issued a plea for public assistance in identifying the missing person who wore this Nike men’s size 9.5 sneaker with an OrthoLite insert. Trouble is number 15 landed on a West Vancouver beach in September, 2018, so why did authorities wait 5 months before going public? Officially 10 of 15 detached feet are identified as belonging to 7 people who died by accident or suicide, 5 remain a mystery. Be that as it may, where are the rest of their bodies? Feet only detach from water logged bodies when they’re encased in a running shoe? Why a cluster of detached feet in Southwestern B.C.? Why 5 months between finding #15 and going public? Surely there’s a reasonable explanation, unfortunately what that might be remains ponderously elusive. Posted in Canada, Mysteries, Our World. Tagged 15th Detached Foot Vancouver, British Columbia, Canada, Mysteries, Vancouver B.C. On February 12/13, 2019 comet Iwamoto makes a rare visit to our corner of the universe. Discovered in 2018 by amateur Japanese astronomer Massayuki Iwamoto, his namesake passes harmlessly at a distance of 45 million km. with astronomical magnitude of +6.5 – too faint for the human eye, easily observed by backyard telescopes. With a wonky elliptical orbit of 1,371 years, comet Iwamoto hasn’t said hello since 648 AD and won’t be back until the year 3390. Point your telescope toward constellation Leo around midnight on the 12th to catch a glimpse of Iwamoto. “The most popular theory about the nature of comets was put forward by American astronomer Fred Whipple, often known as the “grandfather” of modern cometary science. Whipple believed they were like dirty snowballs – large chunks of water ice and dust mixed with ammonia, methane and carbon dioxide. As the snowball approached the Sun, its outer ices began to vapourise, releasing large amounts of dust and gas which formed the characteristic tails. Only a handful of keeners will witness Iwamoto’s passing. Seeing it matters less than knowing it’s out there and tipping your hat to cosmic wonder.